Shots of Arlington National Cemetery, gravestones, John F. Kennedys gravesite, close ups on JFK eternal flame. Middle and high school kids from Shrewsbury, Mass. on fieldtrip to Arlington National Cemetery. Students interviewed about the Cuban Missile Crisis. Exteriors of the White House, the Capitol, American flag waving in the wind. 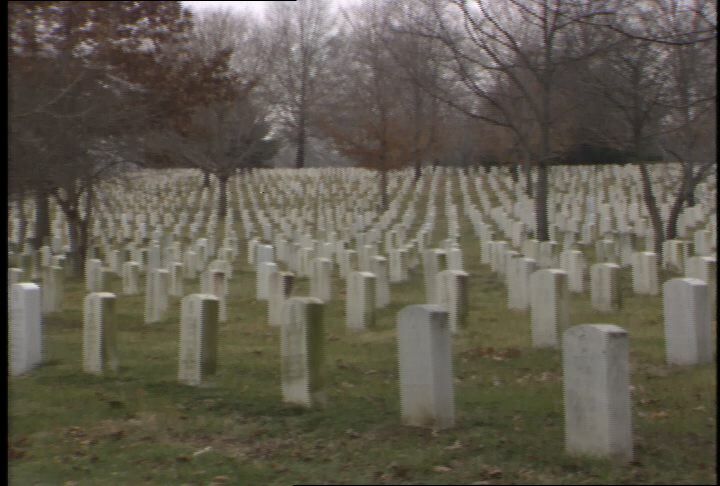 Chicago: “War and Peace in the Nuclear Age; Arlington National Cemetery and Washington, D.C. Landmarks,” 02/18/1986, WGBH Media Library & Archives, accessed April 21, 2019, http://openvault.wgbh.org/catalog/V_269D1759E28F4E14B5F9590A6DA61BCA. MLA: “War and Peace in the Nuclear Age; Arlington National Cemetery and Washington, D.C. Landmarks.” 02/18/1986. WGBH Media Library & Archives. Web. April 21, 2019. <http://openvault.wgbh.org/catalog/V_269D1759E28F4E14B5F9590A6DA61BCA>.